The Drunken Nanny • What’s in a name? Confession time… Every goat in my herd is named. My first two were Chelsea and Apples, and since then every goat has been named including every kid born to them. This might seem slightly bonkers to any dairy farmers reading this, but when your herd starts as a couple of pets, it’s very hard to know when to stop naming them. Will I love them as much if they are reduced to ear-tagged numbers? My children also love getting to name every kid that’s born – and, let’s be honest, they do a better job of it than plenty of parents nowadays. Although, the production of new goats (ie, kidding) adds another dimension to the guilt associated with breeding dairy animals. Would it be emotionally easier to remove these tiny kids from their mothers if they weren’t all lovingly named? At the moment, unless kids are very poorly, we are leaving them with their mothers and occasionally (once or twice a day, depending on age) giving them supplementary formula, so we can start milking the mothers. However, as we are not yet in commercial production (see previous blog on paperwork), we are only at about one-third of full milk production. However, in order to start producing cheese once the aforementioned paperwork is approved we need to start milking our does now so that we have milk “on tap” when we need it in a couple of months’ time. You have to start somewhere! Of course this all takes place at the same time as lambing on our sheep and beef farm, which makes for a pretty hectic schedule (actually, the word “schedule” implies organization, where, in reality, there is barely controlled chaos). In fact, names have been one of the most enjoyable aspects of this new business, not only naming the goats, but coming up with names for the business itself and our (soon-to-be) cheeses. While my children shoulder most of the responsibility for naming the goats themselves, you will not be entirely surprised to hear that the business name was decided upon at a “meeting” in “town” (Martinborough) with “associates” with the assistance of plenty of “refreshments”. I know it was a meeting because I took notes (in crayon), and there were no children present. I must thank these dear friends who have encouraged me with this venture (while not actually offering to do any of the work), and have really only got themselves to blame for my decline into a slightly mad “goat lady”. I don’t “thank” them as much as my husband does though. Anyway, this meeting took place in the middle of last summer’s drought when we were struggling to feed stock and having to sell our ewes left, right and centre, and my gorgeous goats had gone from being a slight obsession to a new potential income stream. I could see the dollar signs and taste the delicious fresh cheese… In our business meeting one friend wondered if it would be possible to feed the grape skins and stems (“marc”) from the winemaking process to the goats as supplementary feed (as is sometimes done with dairy cows). The conversation degenerated from there and The Drunken Nanny was born. So I am delighted to confirm that the company name is not in reference to anyone I know (or my mother – or any of the nannys of Martinborough…). I live in Wellington and visit Feilding on a regular basis. Hi Judith, thanks for taking the time to contact us. Shortly our website will include a section where people can register their interest in our cheese by leaving their email address. We will then send out newsletters about updates in production, and where to buy our cheese. We are also hoping to increase production by December in time for Christmas. Awesome, perfect way to name a business! Also appropriate for our home town. You are an amazing woman Amanda! The farm, goats and, especially, the cheese is fantastic. Can you let me know your email address. 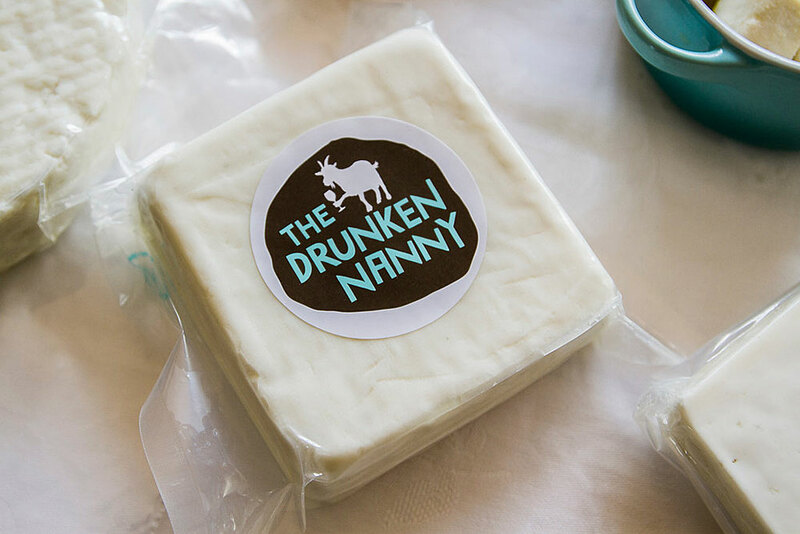 Our email address is amanda@thedrunkennanny.co.nz. Many thanks for the enquiry. We look forward to hearing from you.